Are you in need of inspiration motivation? Gentle Eagle is more than a campground. We would like to invite you to see the rest of what we do. Camping is a North American pastime that we just can't give up on, and there's nothing like pitching a tent on the open prairie to connect us to the indigenous and pioneer people of years ago. Every camping event is like a reunion of a family that keeps on growing and growing. You are welcome to be part of our family, and so, please, let us know how we can keep in contact with you by contacting us. We're not just a Rally Campground!! Book a reservation now for anytime during the Summer! We know you and your family will enjoy all of the fun things we have to offer! Visit our Amenities page for details. Planning a get-together? Let Gentle Eagle Campground provide the meeting room! We moved from Wisconsin to Sturgis South Dakota in 1983 in the middle of a November snow storm. Sturgis had over a foot of snow and my friend welcomed me to the “Banana Belt”. Another bit of information that had passed me by, was the fact that in Sturgis, every August, there is a motorcycle rally that is bigger than any other motorcycle rally in the world. I believe that, at the first motorcycle rally that I went to in Sturgis, there were around twenty-five thousand participants. I knew right then that Sturgis was going to be a good place for my family and me. I remember when I was in grade school that my dad bought a Harley Davidson Motorcycle for $175. It was a 1948 bagger with real leather bags, leather single seat, and springer front forks. He later bought a ‘59 and then a ‘65 Harley. He would take me to school on the motorcycle and my friends thought that he must be a cop. He wasn’t, but he put a lot of miles on those motorcycles. I didn’t need to talk very hard to have Mom and Dad come and visit us in Sturgis during the motorcycle rally and walk downtown looking at the old scooters. Our young daughter, Mary, loved to go downtown during the motorcycle rally in Sturgis. I would carry her on my shoulders and she would get excited while looking at the vintage bikes. It didn’t take long for her to be able to identify a “Knuckle Head”, “Flat Head”, or “Block Head”. In South Dakota, a young person could get a drivers license at the age of 14. When Mary turned 14, she took her tests and got her automobile and motorcycle license all in the same day. I had picked up a 1985 Tour Glide that all family members enjoyed riding. I picked up a 1978 Sportster 1000, and broke it down, working it over and getting it up to par. I put smaller shocks on the Sportster so that it would be easier for Mary to ride and that was her bike until she left home. I became good friends with Ed Neterberg and the people at the National Motorcycle Museum in Sturgis and Mary was able to get a job with them when she turned 16. Pepper who was Director for the Sturgis Rally was her boss at the Museum. Mary helped them move to the new site at the JP building. I always tried to get people go to the National Motorcycle Museum in Sturgis when Mary was working so that she would give them the tour. You would learn a lot of interesting things from her about the motorcycles that were there. Rob and Abigail, our oldest and youngest, have had special experiences during “Sturgis” as well. They both had left for a while, but in the last couple of years returned to the reunion that they had come to enjoy. They have become a great help with the campground. Abi and her husband Andy were such hard workers that I had to tell them to take breaks once in a while. Andy many of the pictures you see on this site. I’m sure that you all have great stories that you could tell and I would love to hear from you. Our oldest daughter, Ketura, has been in the middle of the rally for years. She worked in retail before graduating from high school. Her husband became a police officer in Sturgis and so she was involved with the Sturgis Police Department, even selling Sturgis PD shirts. Please get to know us and don’t be a stranger. Our story will continue to grow and you can be part of it. 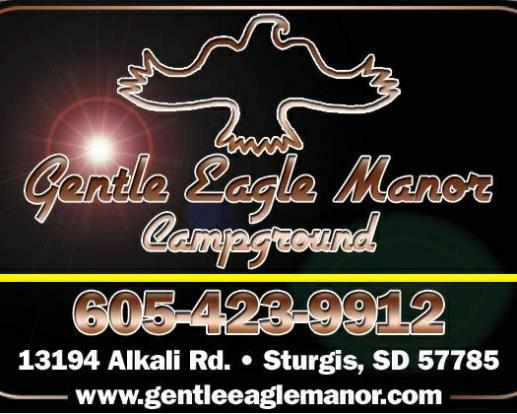 Gentle Eagle Campground is conveniently located East of Sturgis, South Dakota and has become the place to come back to in the Black Hills. Open year around, we have a variety of options for a simple, affordable, and safe place to rest on your way through or as you spend time while touring the area. We have been here since 1997 and we have learned a few things. We are making a few changes for 2019 so that we can serve you better. Camping fees include clean facilities, a hot tub, paddle boats, walking paths, and shaded areas to relax. During the Sturgis Motorcycle Rally, a homestyle supper and breakfast is included. Camping sites are rated by size and amenity. All parking is within the site, so you will need to reserve a location appropriate to your vehicles. During the Sturgis Motorcycle Rally, specific designated sites are not reservable. We will note your preferences, but our primary goal is to schedule you into one site for your entire stay. Campsite reservations fees are due at the time of reservation for the Sturgis Motorcycle Rally and are non-refundable after June 1st. Reservation fees include the campsite and one camper. Additional camper fees are collected upon arrival and must be paid in advance for each camping day. Upon arrival, the reservation holder must identify the purchase with a photo ID. You must contact our office 24 hours in advance to transfer your reservation to someone else. You will need the site number you were provided when you registered. Full rates apply to a camping day with earliest check in at 1 PM and ends with latest checkout at 11 AM. We care about your experience so we reserve the right to refund unpleasant guests for their unused days and send them on their way so that you can have a pleasant stay. Welcome back! You’ll feel like you’ve been here before, even if it’s your first stay.